A tutoring scheme run by City’s Widening Participation Outreach team has been highly commended at a national educational awards ceremony. 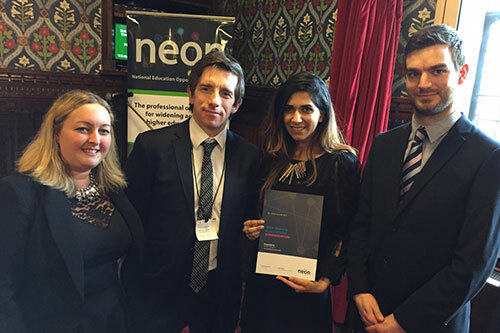 The scheme, which helps pupils at the City of London Academy Islingtonto improve their skills in Mathematics, was highly commended in the Widening Access Initiative category at the 2015 National Education Opportunities Network (NEON) awards. Every year more than 250 pupils at the City of London Academy Islington benefit from weekly tutoring with student ambassadors. There are 30 ambassadors who help the children to significantly improve their results in Mathematics. The scheme, coordinated by Outreach Partnerships Officer, Zohra Moldeina, also provides City students with the chance to gain work experience in teaching and develop transferable skills while making a valuable contribution to the local community. With the help of the tutoring scheme, the City of London Academy Islington has seen a significant improvement in the pupils’ GCSE results over the past three years. When the scheme began in 2011, 45% of pupils at the Academy obtained A*- C GCSEs in Mathematics, which was well below the national average. By 2014 this figure had risen to 73% of pupils achieving five A* - C grades, which was above the national average of 70%. We are thrilled that the contribution this project makes to our students has been recognised by NEON. The work that City does with students across the school is making a significant difference to the lives of those young people and the community we serve. City of London Academy Islington was established in 2010 and is sponsored by City University London and the City of London Corporation. The Widening Participation Outreach team run a variety of widening participation activities and schemes to help young people gain access to, benefit from and succeed in higher education.